A Great Outdoor Family Day! If you are looking for a great soft adventure for the family, have we got a great day trip planned for you! Start out with a leisurely breakfast at Diana’s Delights in downtown Gaylord. Grab some box lunches from the Big Bear Deli and head out to the Pigeon River State Forest Headquarters. Take a short hike to the Pigeon Bridge Campground and enjoy the sites and sounds of Pigeon River. Depart the forest and head north to Wolverine or Indian River for a tubing, kayaking or rafting adventure! 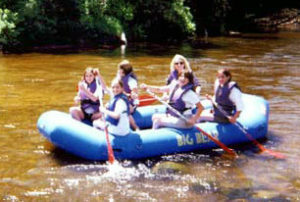 Sturgeon River Paddlesports in Wolverine and Big Bear Adventures in Indian River both offer trips along the Sturgeon, the fastest flowing river in Lower Michigan. After a picnic lunch, return to Gaylord to view the numerous elk, deer and turkeys at Aspen Park. Next head over to the Call of the Wild Museum for a stroll through the museum and a nice round of miniature golf at Bavarian Falls Miniature Golf Park. Finally, it’s over to Bennethum’s Northern Inn for a nice relaxing dinner. Finish the day with a hand dipped cone and chocolates at the Alpine Chocolat Haus and stroll in the beautiful downtown Alpine Village of Gaylord! 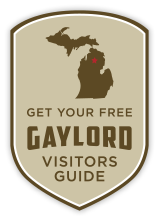 The Michigan DNR completed a trail improvement from Gaylord to Mackinaw City. Approximately, 60 miles, this new trail, with a nice base of snow and good grooming is about as good as it gets. It is scenic and fast and offers plenty of amenities along the way. The ideal day would be to sleep late, get your gear on and meet for breakfast at Bob Evans or B.J.’s. Get going on the trail about 10:00 AM. 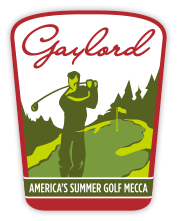 You will enjoy a beautiful scenic ride with gorgeous vistas between Gaylord and Vanderbilt. 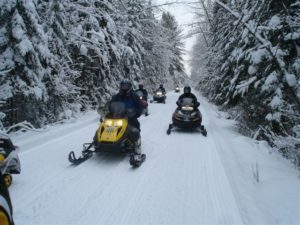 Just past Vanderbilt you will enjoy snow covered pines and the flowing Sturgeon River along the way until Indian River. Just past Indian River in Topinabee you will want to take a break for coffee at the Breakers Inn which is trail-side. Continue north to Mackinaw City go right into town towards the Shepler boat dock and along the shore to get some great pictures of the mighty Mackinac Bridge. Stop back for a late lunch at the Dixie Saloon right across the entrance at Sheplers. After filling up your tank head back to Gaylord along the same trail. You may want to stop and take a break at the Inn Between located on River Street in Indian River. They’re a popular stop for many.